Lung cancer is the deadliest malignancy in the world, claiming more lives than colon, breast, prostate, and pancreatic cancers combined. While early detection greatly increases the chances of successful treatment and improves survival rates, most lung cancers aren’t found until they are at advanced stages. 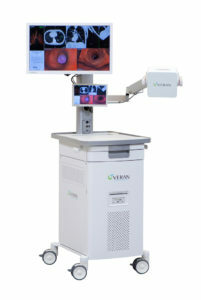 Veran’s SPiNView electromagnetic navigation bronchoscopy system. Technology called electromagnetic navigational bronchoscopy is playing a vital role in turning this trend around. Notably, Cooper is the first and, to date, only hospital in South Jersey to utilize Veran’s SPiNView electromagnetic navigation bronchoscopy system that enables physicians to biopsy solitary pulmonary nodules (SPNs) for the potential early diagnosis of lung cancer. This state-of-the-art navigation system, which is included in the new American College of Chest Physicians (ACCP) guidelines for establishing the diagnosis of lung cancer, provides visualization, accurate navigation, and real-time confirmation of nodule location—something that conventional bronchoscopy cannot do. 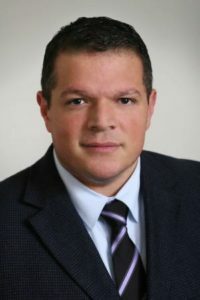 “The lungs simply have too many bifurcations to easily find single nodules,” explains interventional pulmonologist Wissam Abouzgheib, MD. “If you were to spread out the lungs’ airways, the surface would equal the size of half a tennis court. And you’re trying to find the equivalent of a quarter-size lesion using a small needle. “In the past, we’d view CT results, approximate where the nodule was, and try to navigate the airways to reach it,” he continues. “But we often were wrong because there were just too many turns to make. We needed a GPS system to guide us to the nodule. The SPiNView system also offers a significant advantage over other navigation bronchoscopy technology currently available. “The navigational guidance isn’t just endobronchial but also percutaneous,” Dr. Abouzgheib says. “If there’s a nodule near the chest wall but you can’t reach it via bronchoscopy because there’s no airway leading to it, SPiNView allows you to use a needle from the outside. Another unique SPiNView advantage is that the technology complements the CyberKnife robotic radiosurgery system. As more current and former smokers undergo low-dose CT screening based on the U.S. Preventive Services Task Force guidelines, the appropriate selection of patients for biopsy is the key to efficacy and cost-effectiveness. “Having such advanced technology allows Cooper to be one of the few institutions in the region to offer patients earlier, quicker, and more efficacious diagnosis of suspicious lung nodules,” says R. Phillip Dellinger, MD, MCCM, Chair of the Department of Medicine. For more information or to refer a patient for evaluation, please contact Cooper’s Interventional Pulmonology Department at 856.342.2406.